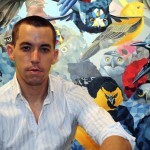 Juan Travieso (born Havana, Cuba 1987) is an artist based in New York and Miami. His work explores notions of impermanence and decay through a combined language of pop, realism, and abstraction.Figures, whether humans or animals, are broken up into spaces and forms much like 3D models, speaking to both their temporality and transition into the digital age. In his recent exhibition, Decadencia, Travieso transposes his work on endangered animal species with works relating to his own childhood and experiences growing up in Cuba. What were before abstractions interacting with disappearing animals, are now figures of disappearing and transforming ideologies and cultures. His paintings now involve images ranging from soviet propaganda and cartoons, to the iconic figures of the Cuban revolution, but woven inside are the personal and cultural icons, which are in constant conflict and transformation. Travieso is a graduate of New World School of the Arts in Miami Florida, Art Center College of Design in Pasadena California, and received Masters of Fine Arts from the Museum School in Boston in 2013. He has had numerous exhibitions in New York, Miami, Boston, LA, as well as internationally. His work is included in multiple collections throughout the United States and other parts of the world.